PARENTS, DOES YOUR BABY DROOL CONSTANTLY AND IS ALWAYS HAVING TO WEAR A BIB THAT COVERS HIS CUTE OUTFIT? - Baby bibs that are unsafe, uncomfortable, and plain ugly? - Bibs with velcro that lose its "stick", scratch your baby's delicate skin, and damage other pieces of clothing in the laundry? - Bibs with a plastic backing that have a crunchy feel and sound to them? And some can even be dangerous to your little one? - Bibs that are so stiff that don't lie flat on your baby's chest and always seem to be bunched up in their face? - Bibs that aren't absorbent at all? If you answered yes to any of these questions, then we have the solution for you! The Matimati Baby Bandana Bib is a great alternative to the traditional baby bib... why? - Are great for droolers and teething babies. They are the perfect drool bibs! Click the "Add To Cart" Button at the Top of this Page and Your Baby will be Drooling in Style! 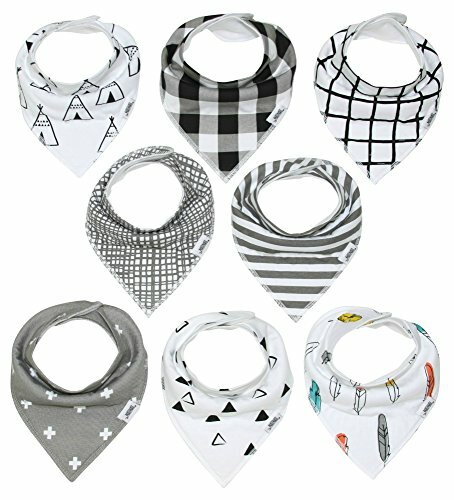 CUTE & COMFORTABLE BABY BANDANA BIBS - Modern set of 8 trendy unisex bibs. Neutral patterns look great on both boys and girls. Ultra comfortable design with baby in mind. Your baby will be drooling in style! UNIQUE BABY SHOWER GIFT SET - Best registry gift for new moms. "These bibs are amazing. They are stylish, comfortable and so soft. My son is the most stylish kid at the day care. Love them!" says a satisfied mom. Moms love these modern, fun, and practical bibs. AWESOME CUSTOMER SERVICE - We truly care about every single one of our customers. Not only are our bibs made with love, but we go above & beyond with our customer care! If you have any questions about this product by Matimati Baby, contact us by completing and submitting the form below. If you are looking for a specif part number, please include it with your message.